You Have Options To Drying Paint! You have options in drying paint… Make the right choice! Seasons are changing and there are many factors that are a key part in drying paint. These factors all directly prohibit thorough and even drying on all vehicle surfaces. These factors are, humidity, poor air movement, boundary layers, and the temperature. It is possible to use heated air at low levels (10-15°F) in every step of the painting, whether primer, sealer, basecoat, or clear coat. Heated air aids in creating an evaporation effect, as a result reducing humidity in the paint booth. This causes the dispersion of remaining moisture from wet paint on the vehicle or parts surface. This speeds up the drying process. The primary goal in drying clear coat is to increase the surface temperature of the vehicle to 140°F on all surfaces. With Clear coat this creates the best drying environment for the most efficient results. For waterborne, low humidity painting environment is ideal for drying in spray booths and will provide faster drying times. High humidity in the paint booth will result in slower evaporation of water from the paint therefore, delivering slower dry times. To improve drying efficiency in a high humidity painting environment it is important to use heating system in the paint booth. Every increase in temperature of about 10-15 degrees reduces relative humidity by approximately 10%. A paint shop with low humidity environments does not require a heater for the spray booth. High temperatures followed by improper cooling during the primer, sealer, and base coat phases, could ruin the paint. In this article we will take a closer look at the different Spray booths and the differentiating characteristics and what that means to you. What is a boundary layer and what are the results? 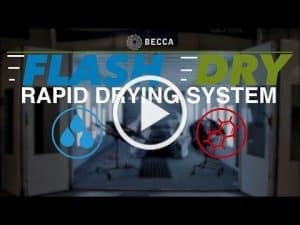 BECCA’s FLASH DRY Addresses All Factors!